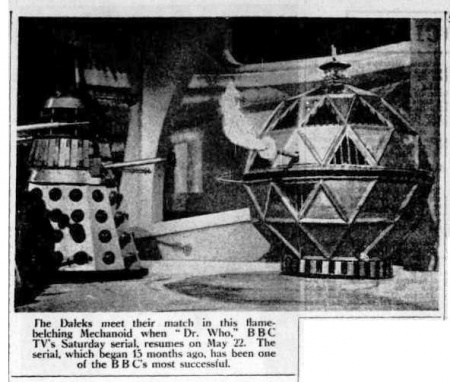 The Daleks meet their match in this flame-belching Mechanoid when "Dr. Who," BBC TV is Saturday serial, resumes on May 22. The serial, which began 15 months ago, has been one of the BBC's most successful. APA 6th ed. : (1965-04-15). The Daleks meet their match in this flame-belching Mechanoid. The Daily Telegraph p. 17. MLA 7th ed. : "The Daleks meet their match in this flame-belching Mechanoid." The Daily Telegraph [add city] 1965-04-15, 17. Print. Turabian: "The Daleks meet their match in this flame-belching Mechanoid." The Daily Telegraph, 1965-04-15, section, 17 edition. This page was last modified on 30 May 2017, at 23:01.